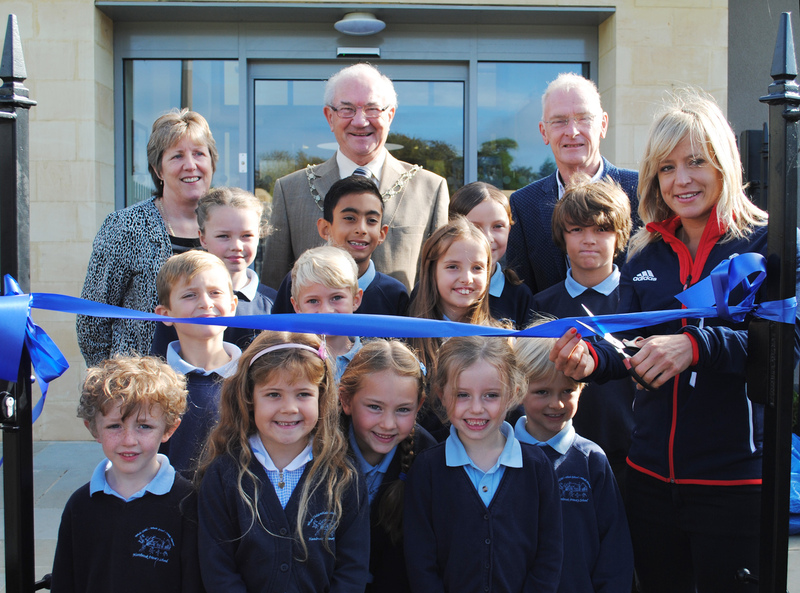 Olympic bronze medallist and ex-pupil Jenny Jones cut the ribbon to officially open the new extension at Hambrook Primary School in South Gloucestershire this morning. Jenny was joined by the Chairman of South Gloucestershire Council’s Children and Young People Committee Cllr Ian Blair, Chairman of South Gloucestershire Council Cllr Howard Gawler and the school’s 200 pupils, along with teachers and parents. Pictured from left to right are headteacher Jo Dent, Cllr Howard Gawler, Cllr Ian Blair, Jenny Jones and some of the school’s pupils. Hambrook Primary School’s new extension was completed in September following 18 months of construction. South Gloucestershire Council funded the £3.5 million project which includes a new extension building and refurbishment of the school’s existing Victorian building. The extension provides additional facilities including a new hall which can accommodate the whole school for assemblies and other activities, a new modern classroom space and areas for teaching small groups. The building works were completed in multiple phases to minimise disruption to staff and pupils. Chairman of the Children and Young People Committee Cllr Ian Blair said: “It is fantastic to see this project at Hambrook Primary School completed and in use by pupils. We have replaced some of the outdated buildings whilst refurbishing others and the school’s teachers and pupils now have modern and practical teaching and learning facilities. Snowboarder Jenny, who won a bronze medal at this year’s Sochi Winter Olympics, was invited back to her old school for the official opening ceremony. Jenny previously visited the school back in spring to show off her medal to excited pupils.